Tala, Paphos – This small project of luxury apartments and villas is located on the hills above the popular village of Tala, which has many local amenities, including a lively village square with a good variety of restaurants and tavernas. Paphos is a 10 minute drive away. 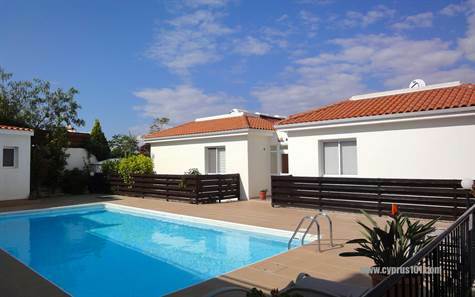 Built into the hillside, this beautifully presented apartment is situated at the lower level. The property features a spacious living room with lounge, dining area, and end kitchen which is fully equipped with built-in oven, electric hob, extractor fan, fridge freezer, dishwasher and washing machine. Patio doors lead from the lounge to a large terrace and L-shaped garden with amazing sea and mountain views – a fantastic place to relax and watch the sun go down! Off the living area is a hallway to the master bedroom, second double bedroom and family bathroom. Patio doors from the master provide lovely views and access to the garden, and both bedrooms have fully fitted wardrobes. In summary this is a unique property with exceptional views, ideally suited as a holiday home/rental investment. The property comes fully furnished and ready to move in. Please refer to MLS#: 1215 when inquiring.